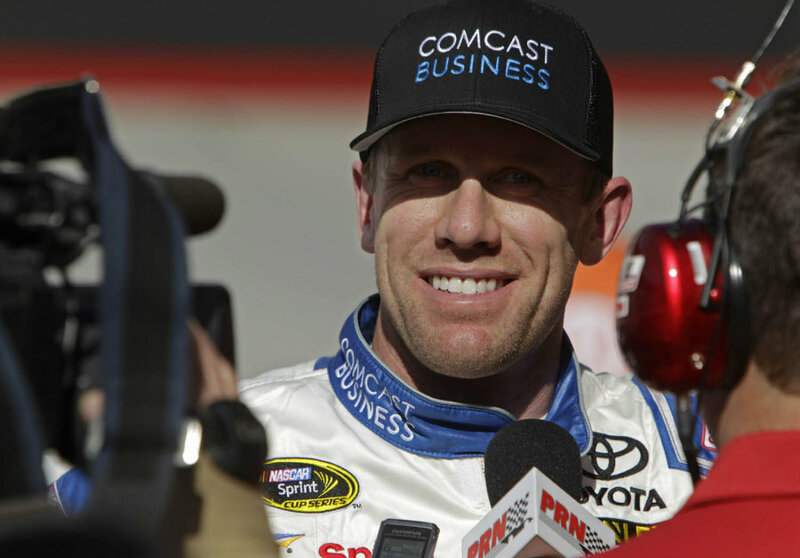 The American driver Carl Edwards took the pole position in qualifying at the Toyota Save Mart 350 to be held on Sunday at the Sonoma Raceway in California. The event starts at three p.m. ET and can be watched on Fox Sports 1. Kyle Busch achieved the first place at last year’s competition. Edwards completed the classification challenge in 74.799 seconds with the No. 19 Toyota Camry. Anthony James Allmendinger arrived at the second position with 74.978 seconds, driving the No. 47 JTG Daugherty Chevrolet. Martin Truex Jr. was the third place player, achieving 74.881 seconds with the No. 78 Toyota Camry. The top ten was followed by Kurt Busch, Kyle Larson, Denny Hamlin, Joey Logano, Kyle Busch, Paul Menard and Tony Steward, respectively. Kurt Busch performed with a maximum speed of 95.654 mph. On the other hand, last’s year winner Kyle Busch ended eight in his No. 18 JGR Toyota, registering a top speed of 95.233 mph, said NASCAR. Veteran Edwards had previously won the Sonoma in 2014. On Saturday, he led the race immediately after the first round, until the final lap. He reached a speed of 95.777 miles per hour as players entered in the 10-turn, said Fox Sport. The Sonoma Raceway is 1.99-mile long. It is the first road racing to be celebrated on summer at the NASCAR Sprint Cup Series. On Saturday qualifying, Edwards won his third pole position of the year. He has repeated the same achievement 19 times during his career as a driver. “It’s so neat. My teammates have helped me a ton. I just hope we can put this together for another win. We’re having a good season. We’re here to win,” Edwards was quoted as saying by Fox Sports. Dale Earnhardt Jr., who has won the Most Popular Driver Award thirteen times, qualified thirteenth after being the fastest racer in Happy Hour Friday. The son of NASCAR Hall of Famer Dale Earnhardt Sr. said he feels he is driving the best car he has ever had. Kyle Busch alongside Tony Stewart, are the only active Sprint Cup drivers who have conquered the number one place at the Toyota Save Mart 350 several times, said the Bleacher Report. They couldn’t surpass Edwards after he started dominating the race. Car handled well in qualifying. Didn't drive the cleanest lap but we backed up our speed from yesterday. Good starting spot for race day. Edwards’s pole position would play a relevant role tomorrow. The driver has achieved two victories, five top-five finishes, and ten top-ten finishes said the Bleacher Report. He has been the favorite of many NASCAR fans during 2016. Developer Dusenberry Martin Racing unveiled on Friday the new cover of NASCAR Heat Evolution game, featuring Carl Edwards alongside his orange Toyota. The new title will be available for PlayStation 4 and Xbox One. Edwards won a place at the cover of NASCAR Heat Evolution, after he became the highest finishing Toyota driver at the Sprint All-Star Race on May 21, said the developer. He ended fourth in the same race, carried out at Charlotte Motor Speedway. “We were the top-finishing Toyota, and I had forgotten about the video game cover, so the top-finishing Toyota gets the cover of NASCAR Heat Evolution, which is pretty cool. We got something out of the night,” Edwards was quoted as saying by Fox Sports. Dusenberry Martin Racing said this was the first time that all 23 licensed NASCAR tracks will be included in an HD video game. The new video game has pick-up-and-place races, a Career mode, and a new Chase mode that takes players to the final ten races of the racing season. Players who complete the ten races will receive the NASCAR Sprint Cup Series trophy. The developer said the game comes with a new algorithm that determines which is speed is better depending on the player’s abilities. The game can be pre-ordered at NASCARheat.com for $59.96 and will be available on September 13, 2016. Next NASCAR event after the Toyota Save Mart 350, will be held on Saturday, July 2 at the Daytona International Speedway.